It's a big brown box! Or maybe it's a house with windows and a door. Or a cozy, dark cave. Or a ship on the ocean. But whatever it is, Sam's box is no place for baby brother Ben. 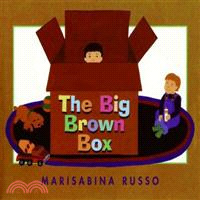 There's BIG trouble brewing over the big brown box...until Mama finds a solution that's a perfect fit for everyone. Children's Books 2000-NY Public Lib.